Only a handful of days left of the year 2017! It’s been a super year, especially the last several months so clearly sharing some super foods with you makes sense today! But before we get into the overnight oats, I wanted to share my thoughts on something I feel like is filling up every bit of media lately. The topic: New Year’s Resolutions. I was very happy when I Googled “New Year’s Resolutions” recently. Since all I kept seeing on Facebook and other social media outlets were focused on weight loss in the new year, my search found that something even better pops up. According to a recent study as reported on USA Today, the most popular resolution has nothing to do with our waistlines for 2018. More and more people are making their resolution to be a better person. Before I started to write this post, my plan was to tell you how I don’t believe in New Year’s resolutions because so many of them have to do with changing ourselves physically. Or that society makes us feel like that’s what we need to be doing in the new year. I was going to talk about how we should make our resolutions into revolutions and instead of focusing on ourselves on the outside, we could focus on who we are inside and who we can be for other people. I had a whole argument on why we need to let go of the concept of weight loss and that we need to learn to love ourselves exactly as we are, whether that is 15 pounds more than we think we should be. But then, after all the planning, Google, of all things, restored my faith in humanity and made me realize that the words I wanted to say were already out there. So yes, if New Year’s Resolutions are your thing, consider this one for sure. Consider how you can be kinder, what you can do to make others around you happier, and perhaps this will make you feel even better than you ever imagined. Kindness is free and it doesn’t require you to change yourself physically or lose a single pound. And I bet that the more you do to be a better person, the less you will obsess over what is in the mirror. Nonetheless, the weight loss messages will continue to bombard you this season. Do what you can to quiet them. Remember as you become a kinder person to others, that you also need to be a kinder person to yourself. And again, that means learning to love you for you no matter what the scale says. There’s nothing wrong with wanting to take better care of yourself, don’t get me wrong. But if you don’t love the person in the mirror now, then the same person 10 pounds lighter will probably still not feel the love. And if New Year’s Resolutions aren’t your thing, then just keep on keeping on! And don’t forget to enjoy every last minute of 2017! Ok since we are gearing up for a super year, let’s kick it off with some Superfoods. The term Superfood is just meant to be given to foods that are very nutrient dense or essentially have ‘super powers’ against disease or can help support your overall health. 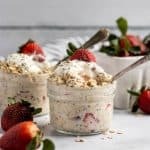 There is not a strict list of what is and what is not, but things like chia seeds, maca powder, the acai berry and even cacao powder are on the list. If you look at some lists, oats make the list so getting your oats in is always a great thing. 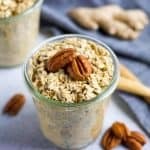 Ginger has been deemed a superfood by many and that is the spice in these oats! These oats sure are super one could say. 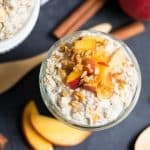 I have been so into gingerbread this season that I couldn’t let it pass without some sort of gingerbread inspired overnight oats recipe. I mean, oats are my bread and butter here so it just comes with the territory. These have the flavor of Grandma’s famous recipe but you get to eat them straight from the bowl! If this is your first time to Be Whole. 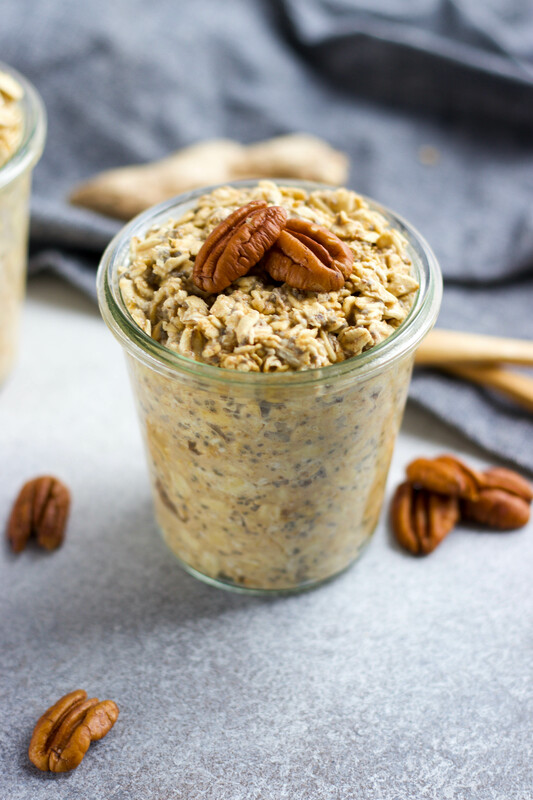 Be You., then feel free to check out the long list of Overnight Oat Flavors here! The Banana Bread flavor is by far the most popular so a great place to start as well if you are on the fence about them. Combine all ingredients in bowl or jar that can be sealed. Eat cold or heat before serving. Add more milk if needed. This looks amazing and healthified — which I desperately need right now! I love all of the flavorful goodies you incorporate in the breakfast. I’d never thought to mix gingerbread spices with maca! This sounds so delicious! I love gingerbread flavored anything. And cheers to everyone making resolutions to be better people! Your Google search result makes me so happy! Here’s to a year where we all work on treating ourselves and each other a little better 🙂 Oh, and these oats look incredible! !